Hassan Hajjaj, Hindi Kahlo, 2000, metallic Lambda print on Dibond with wood and Coca-Cola cans, 51 x 37". For almost fifteen years, the Moroccan artist Hassan Hajjaj has been making loud, uproarious photographs pairing the conventions of historical West African studio portraiture with the accouterments of Arabic kitsch. The pictures are light and fun and quote knowingly from art history, pirated fashion, and the curious flotsam of globalization. People tend to love or hate Hajjaj’s work—a predicament not helped by his sobriquet, the Andy Warhol of Marrakech. But wherever you fall on the spectrum, you can probably agree that the work doesn’t quite play well with others. Perhaps it’s a sign that this crammed but generous show of ten very different artists is working. 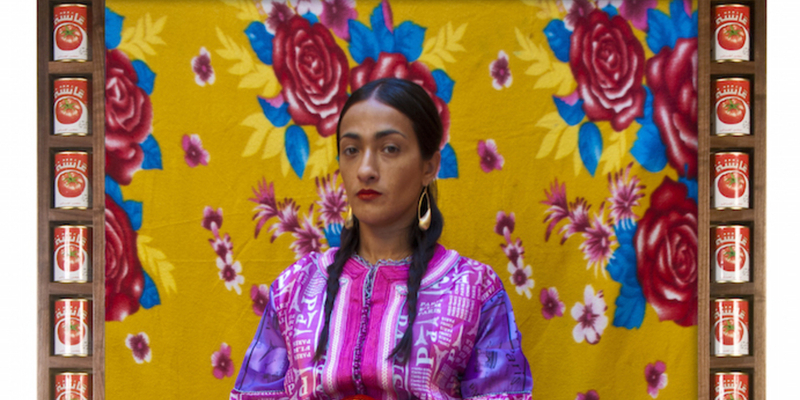 The exhibition includes three of Hajjaj’s portraits—Hack, 2011; Zezo Tamsamani, 2010; and Hindi Kahlo, 2000, a riff on Frida—and they are wonderfully offset by three of Omar Victor Diop’s portraits. Diop, from Senegal and a generation younger than Hajjaj, captures doses of attitude, utterly contained in the bodies of his subjects, with his images of young, regal, and defiant women. Hajjaj’s sensibility, by contrast, is diffused over patterns, poses, references, and elements of assemblage. So well do these six images ticktock that one can easily forget the ostensible binary here is Africa and South Asia, not the Maghreb and the sub-Sahara, figuration and abstraction, minimalism and maximalism, masculine and feminine, seriousness and play. “Interwoven Dialogues” is, of course, a patently lousy title, but the sheer density through which the curator Awam Amkpa is exploring textiles—physically and metaphorically, as tactile material and social code—allows for meaningful and surprising links, not only between Hajjaj and Diop but also between the Algerian calligrapher Rachid Koraichi and the more conceptually minded Aisha Khalid, from Pakistan, whose rose-is-a-rose diptych West Looks East, 2013, packs in another dichotomy still.